​Is it a bad week? 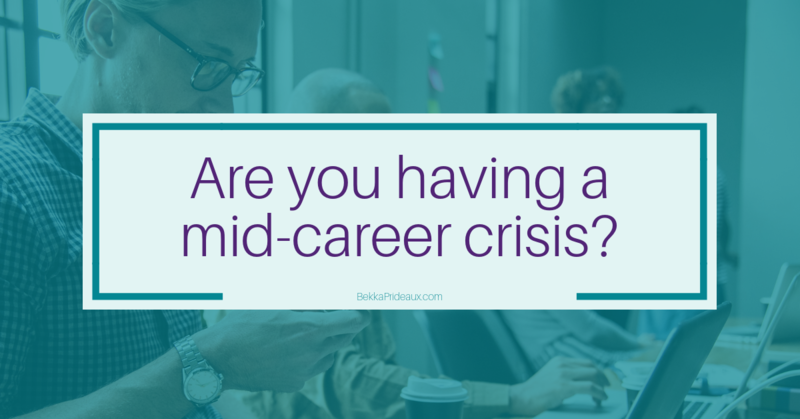 Or are you having a mid-career crisis? We all have bad days at work; days to make us question why we are doing the job we are doing. But because we know this is a normal part of working life, it’s easy not to notice when it becomes something more, a mid-career crisis. Having a mid-career crisis is something that can hit anyone, regardless of their role, age or location. It impacts not just the individual but also their team, their company and their family. And those who feel it most acutely are often those who on the surface seem to have the least reason to feel the malaise that comes with it. Research by Professor Andrew Oswald of the University of Warwick (cited by Hannes Schwandt in the Harvard Business Review) found that job satisfaction is consistently at its lowest midlife and mid-career. The research also shows that satisfaction rises again towards the end of our careers where it often peaks higher than before it went into this slump. Given this U-shaped curve in satisfaction and happiness at work, how can we tell if we just need to ride out the curve or if we are having a mid-career crisis that we need to take action to resolve? You’re contemplating your next career move and you know it’s no longer just about the money and status. Your job satisfaction is probably more important than your future compensation. You rose to your current position relatively quickly and those successes came quite easily – but now you feel there is nowhere to go. You don’t feel valued and your self-confidence is wavering. You’re questioning if the next job move the company is proposing is really for you or if it takes you further away from your priorities and the elements of your current role that you enjoy. You no longer feel the need to prove yourself at work. You’re feeling passed over for the younger generation. How to develop and motivate them, and succession planning seem to be the only topics that get people management air time. You’re not inspired, and you know you’re not at your best when you are not inspired. You’re not learning anything, and it feels as if the job is the same old same old. You’ve lost sight of your hopes, goals and dreams; what matters to you feels submerged. You’ve felt in this slump/funk for a while and certainly more than is normal for you. Recognising if you’re having a bad week or a mid-career crisis puts you in control of what you need to do next. Should you ride it out or work towards changing something? If you are contemplating changing something major, then take the time to reflect, plan and take considered actions. After all, you want to make sure you don’t end up with the same lack of satisfaction in what you decide to do next. If you recognise several of these signs, Your next career chapter coaching may be just what you need to overcome your mid-career crisis. Why not book a free consult call?